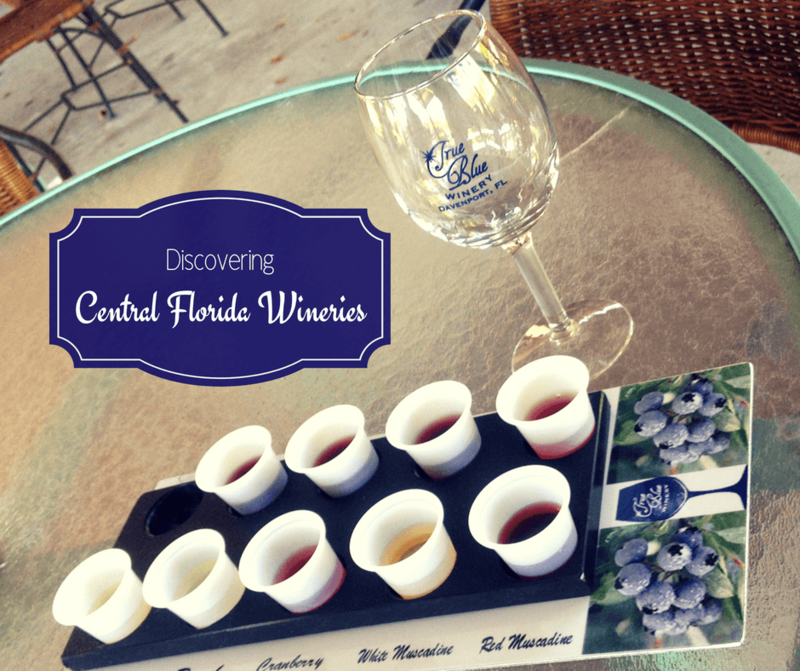 Visiting Central Florida wineries should be on everyone’s list when exploring the area. Read on to learn more about one of our favorites! What comes to mind when you think of Central Florida? Probably theme parks or maybe going on some outdoor adventures with your kids? We can guarantee that what did not come to mind were Central Florida wineries. Well, we think that needs to change! One of our favorite vineyards in Florida is True Blue Winery. Located in Davenport, it is a charming and delightful winery and bistro that my friend MaryAnn and I found after the hot air balloon ride we’d had that morning. As you drive up to Polk County’s first and only winery, you can see the rows and rows of blueberries. During blueberry season (March-May) you can pick your own berries, and the site is often used for private parties and weddings. The bistro has both indoor and outdoor seating, and it’s all decorated so beautifully. They serve steaks, sandwiches, salads, of course cheeses. Their specialty, however, is brick oven pizza. Since we got there just as the winery opened, it wasn’t quite fired up yet. 🙁 But it’s ok, because the real reason MaryAnn and I went was to sample the wine! Look at that brick oven! For $10 we were given 9 samples and a wine glass to try them in (which we got to keep). The samples included blueberry wines made at the winery and some others, like peach and cranberry, that were brought in. The only one I didn’t really like was the peach, but I’m just not a fan of peach flavored things. We love finding wineries in unexpected places (kind of like when we found hundreds of wineries in Iowa!). There’s a lot more to Central Florida than people think, and wineries are among some of the attractions that we personally would love to explore more of. We found this Florida winery map, which we plan on using A LOT. During our visit to True Blue Winery, we really liked it because of it’s simple elegance. We were treated like family from the second we stepped foot inside and loved the casual atmosphere. We definitely recommend stopping in to see them, or any of the wineries in Central Florida. Great post! I recently wrote about the best Italian wine trip, and I had the opportunity to learn abt the Australian yarra valley road. The Californian way is still unknown to me, thank you for the inspiration! BLUEBERRY WINE?!!!! Amazing – and that choc chip ice cream yummy 🙂 It’s interesting because you always associate California with USA wines and never realise Florida also has a few gems as well. In recent years, I’ve been going down to Florida at least once or twice a year, so I’ve pinned this for future reference. I love visiting wineries, but I don’t think I’ve ever had blueberry wine. We tried kiwifruit wine in New Zealand but it was a bit sweet for my taste. I like the idea of being able to snack on wood fired pizza or some cheese with your wine sampler at this winery. Such a cute winery! Hopefully we can make it to Florida soon and visit! I must admit I don’t know much about wine (let alone fruit wine!) but these ones look quite different! I do too! But I didn’t think they were too sweet. I’m sure you’d like it if you tried it. I’m really curious what blueberry wine tastes like. Is it fortified? I’m guessing quite sweet? Hi Fiona! There were a few varieties, some sweeter than others. Looks like a beautiful property to explore. And an interesting tasting experience. Not sure if they’d be too sweet for me but I’d give it a try. 9 samples for $10 seems like a steal to me. I don’t drink much at all hardly ever, but one day I would like to try the experience of a winery. Hi Holly! You should, it’s a lot of fun. And if you don’t usually drink much, having samples would probably be best. I’ve truly never heard of blueberry or any other fruit wine other than the traditional grapes used. The tasting flight with its semi-dry, sweet, etc looked liked a good way to sample and compare the different tastes. Wine aside, it’s always nice to spend time with a friend and explore a local place. That is a cool find. I’ve never even heard of Davenport, Florida. You didn’t even stop to get me. 😉 Nor have I been blueberry picking. Hint Hint. We sampled a lot of fruit wines in North Carolina, but my husband did not like them. He is some sort of a wine connoisseur so he goes for the real thing. But I always love a winery like True Blue because of the elegance of the place, the good food, and the gift shop with pretty little things! Looks like a really nice place! I’m not a big fan of fruit wines; I often find they’re a bit too sweet and syrupy for me. Glad you enjoyed them, though! Looks like perfect place for date with wife outdoor after 5 years being together. 🙂 I liked a lot their decoration. My wife adore this type of decoration.